In times gone by there was a myth that VMware View could not be backed up using traditional methods and I would disagree with that. With everything, there are always going to be limitations and it’s just about understanding those limitations. Every component that can be backed up mentioned in this post can be backed up using the Vembu BDR Suite and needs no special agent or product. In this post, we focus on older versions of VMware View for backward compatibility but will discuss where components have been deprecated and where newer v7 components need discussion. 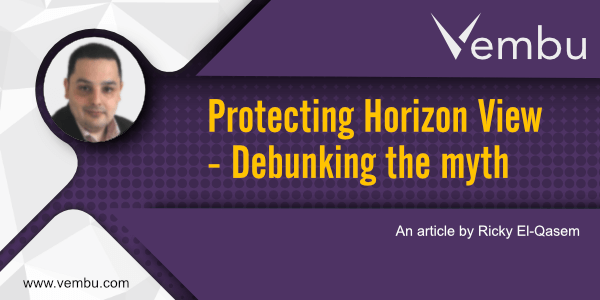 The assumption is you understand the architecture of VMware View and Horizon. So the myth came about because of one specific limitation. The current technique for backing up virtual machines which essentially what virtual desktops are, is to use the VMware snapshot function. 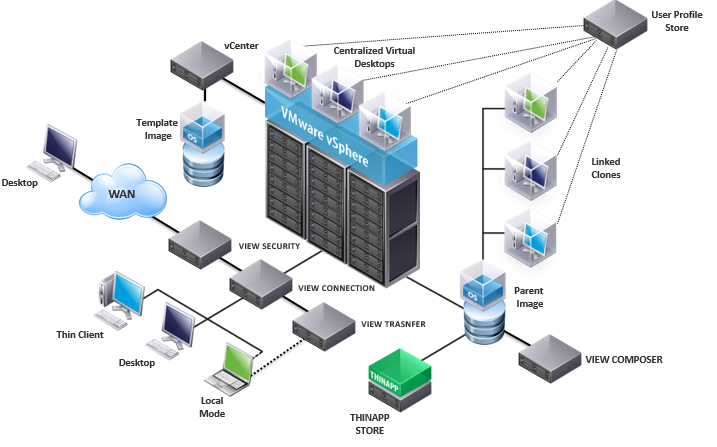 It is common practice to use a clone of a master desktop image, and VMware offers a very efficient way of creating something called a linked clone. Instead of cloning the whole desktop image VMware would create a delta disk and which was very quick and referred to the master desktop image for reads. This minimizes storage requirements for VMware View desktops and was very quick. The issue was the VMware snapshot function couldn’t snapshot this linked clone effectively. This one fact lead people into thinking VMware View and virtual desktops couldn’t be backed up… Not true… So let’s see why. The concept here is to tackle clones, data, and management software separately. We’ll discuss each of these in the following sections. So let’s discuss that in more detail. Linked Clones can be created very quickly so knowing that is it worth trying to back up the Linked Clone when we can refresh a virtual desktop in a matter of minutes. Probably faster than you could restore a whole desktop. NOTE: so that I don’t miss this. You could argue that if the VM snapshot is not effective with linked clone snapshots then use the storage array snapshot to capture the storage where the linked clones reside. You could, but I don’t think there is a need. If you understand the myth, follow best practice and this document you should never need too. But what about the contents of the linked clone I hear you say? What about the user data and the applications that were added after the creation of the linked clone. If you refresh the machine, those would be wiped out sure? Well, that is a nice Segway. Really to take full advantage of virtual desktops you should have designed that all user profiles, user persona, and any data created by the user be centralized somewhere. This is typically stored on a share on a server accessible by the user and the desktop. Why this is good practice is because typically linked clones are seen as floating desktops. A user may not get the same desktop they were on last time and given the configuration may actually receive a fresh desktop every time they logon. Easily done with VMware View and the advantage is that any problems that may have been introduced into the last desktop, like a virus or dodgy software are wiped out automatically as the desktop is automatically destroyed and refreshed… The only way to take advantage of this floating desktop idea is to have user persona/data centralized, so it’s available to the user on any desktop. So how do you do that? Well, you either use the native VMware UEM solution or my favorite is using Liqduidware Labs Profile Unity to manage the centralisation of User Persona and User Data. Using these tools gives you the freedom control how persona and data are accessed. Ya see nothing too complicated there right? What about the applications installed on the virtual desktops? Applications that were installed in the master image are protected when you protect the master image which could be another VM or a VM template. And as long as you have those in your backup schedule then you are covered. What about streamed Apps? So it’s very common today to use an application streaming function to stream apps into a desktop mid-flight and not have to worry about applications installed in the master image. This is done using 3rd party tools like VMware App Volumes or again my favorite Liquidware Labs FlexApp. These tools typically have a repository where the applications to be streamed are stored and centralized. Normally it’s a file share…. You see where I’m going with this now… most of the time the important pieces of the puzzle are easily protected by something like Vembu because they reside in a file share, in a VM that is not complicated to backup and restore at file-level. Virtualized Apps? Part of the VMware Horizon Suite is a tool called ThinApp that allows you to package up applications into a single file. It means as long as a virtual desktop has access to this single file it can run the application without installing the application. 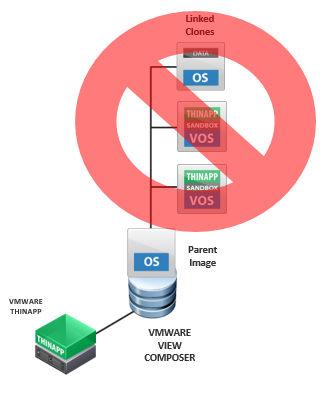 The good news again is these “thinapps” are stored in a file share… bingo we can backup VMs that contain shares easy! And restore at file-level using Vembu. If your virtual desktop is a full-fat persistent desktop and not created from a linked clone then you have no issues backing this up as a normal VM. However, there is a chance that your persistent desktop was created from a linked clone… it’s persistent because the plan is not to have it floating or destroy it on logout but it’s still derived from a linked clone….having researched this scenario many times it has a very low use case… centralizing apps and data will help though if you still need to protect this kind of desktop. Or worst case it’s back to SAN snapshot. Now we have discussed how to protect the desktops let’s focus on the management software components. Streamlines data to View Local mode client. It used to transfer whole virtual desktops down to an end-point for use locally. Hopefully, you got the message and you’ve seen you don’t need any fancy expense backup products with expensive agents. All you need is a good VM backup solution like Vembu BDR. As long as you have a consistent back using VSS you are good to go. Don’t try to back up the linked clones themselves, backup the artifacts that constitute the linked clone. Centralize user persona, data, applications, and make sure you backup the parent images while protecting the core components. Ricky is a guest blogger for Vembu. He is a Virtualisation and Cloud Veteran. Started in the industry 24 years ago as a consultant working with Novel, Microsoft, Storage, Compute and Networking. Fast forward 7 years and Ricky saw a niche in the market and started to specialise in VMware virtualisation and was once one of the first VMware instructors globally.